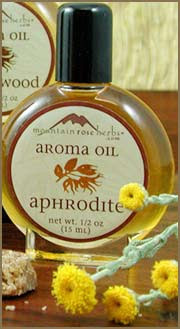 > Roots & Flowers: Aphrodite Oil ~ Yum! Got my Mountain Rose Herbs order today and I am SO excited to have my bulk herb jars filled again. Got nettle, oatstraw, raspberry leaf and peppermint this time for my daily herbal infusions. I feel nourished just looking at them! But what I'm really excited about is the yummy Aphrodite Oil I splurged on. I usually don't buy scented stuff without smelling it first but this blend came highly recommended and I am really glad I did! My senses are twinkling! I just love the combination of scents. It's exotic and sensual and not at all overpowering. It comes in a spray also which is cheaper, but I really wanted the oil. I really needed something new and exciting for my senses to break up winter's monotony and this stuff is just the ticket. What are your favorite scents to wear in winter months? So funny you posted this - I was JUST thinking of ordering the Aphrodite oil - actually it was the spray I wanted. But I was wondering if the patchouli was really strong? I do like it but usually only in blends. How strong is it? I feel the same way about patchouli! It has to blended - and I think it blends really well with rose. In this blend it is very subtle. I'm loving it. Oh i LOVE this blend! I totally know what you mean about patchouli - I love the stuff but always feel a bit weird wearing it straight - lik eI just came from a Grateful Dead show or something LOL! ;) But thi sblend is super subtle. The Ylabg Ylang about sends me over the rainbow... Swoon! Thank you for this post - I order from Mountain Rose Herbs a lot, and I was wondering about this oil. I think I will have to try it. I've it too! All the girls in my office looove it!